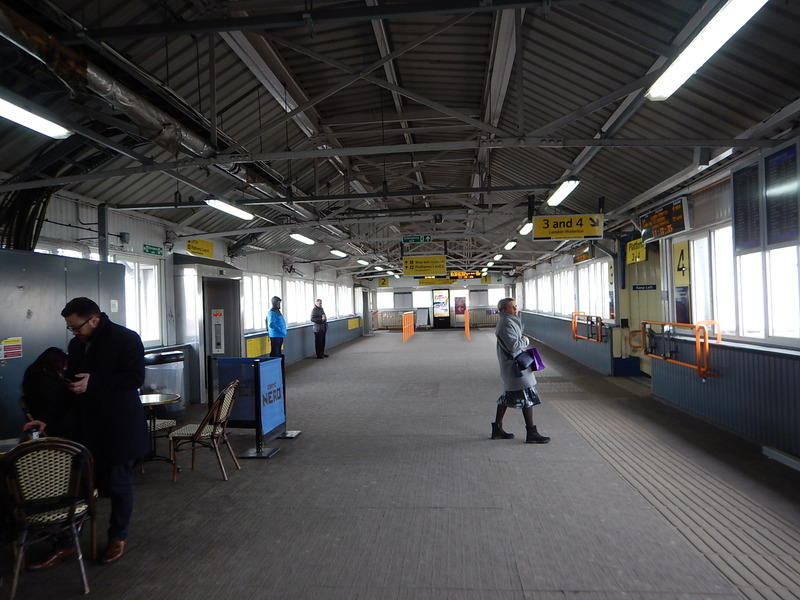 Could Crossrail And Thameslink Serve Clapham Junction Station? This may seem a silly question, but I believe it is a valid one for the following reasons. Wikipedia says this about Clapham Junction station. Routes from London’s south and south-west termini, Victoria and Waterloo funnel through the station, making it the busiest in Europe by number of trains using it: between 100 and 180 per hour except for the five hours after midnight. The station is also the busiest UK station for interchanges between services. It is also the tenth busiest station measured by passenger numbers in Great Britain. Clapham Junction station has both a bridge and a subway between the seventeen platforms. The bridge is fully step-free with lifts to all platforms. The bridge between platforms is not only step-free, but very wide. rchitects have copied this Victorian design at Leeds and Reading stations. When I go to Portsmouth or Southampton, I will often avoid Waterloo, by using the Overground between Dalston Junction and Clapham Junction stations. It may be slower, but it is a very easy interchange, especially if I go step-free on the wide bridge. Perhaps this explains why interchange passengers at Clapham Junction, are almost as many as those entering or leaving the rail network. With some journeys like say Southampton to Wembley Stadium, changing at Clapham Junction is probably the most convenient. This interchange, is something I use a lot, as I have four trains per hour (tph) on the London Overground, from my nearest station at Dalston Junction. As there are thirty-one stations on London’s circular railway, the interchange probably generates a lot of traffic. If you want to go to say Gatwick, then generally the same platform will be used. This can’t be said for many stations. 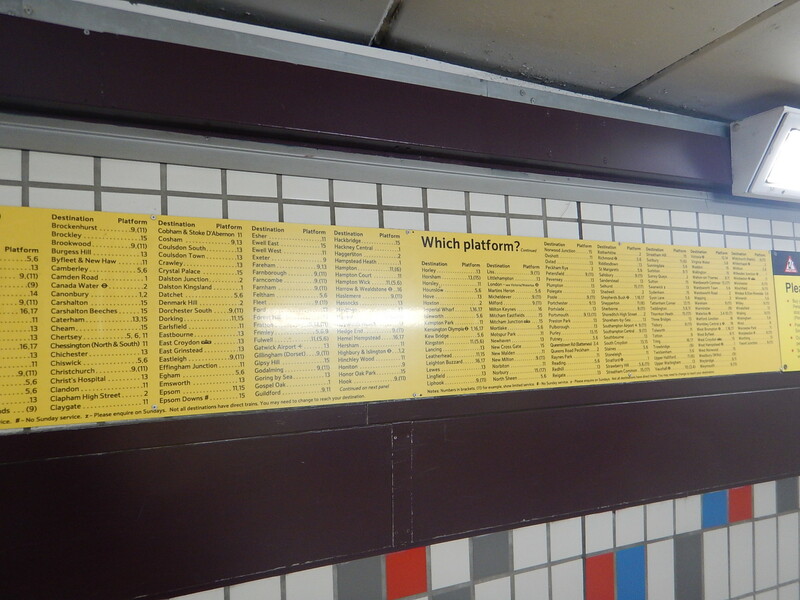 The station even has lists of stations and the platform to use. This would be impossible at most large stations! But this is the busiest station in Europe by the number of trains using it! The Victorians certainly got the design right! Does this passenger-friendly design attract passengers? Crossrail and Thameslink don’t call at Clapham Junction station. But some services do directly link Crossrail and Thameslink to Clapham Junction station. This West London Line service has a frequency of four tph, which from some time this year will be raised to six tph or one train every ten minutes. It will have the following interchanges in the future. It will also have interchanges with the Bakerloo, Central, District, Jubilee and Victoria Lines. This South London Line service has a frequency of four tph, which from some time this year will be raised to six tph. It will also have interchanges with the District, Docklands Light Railway, Hammersmith and City,Jubilee and Northern Lines. This West London Line service has a frequency of one tph. If Crossrail is extended along the West Coast Main Line, there will be additional interchange stations. It will also have interchanges with the Bakerloo, Central, District and Northern Lines. There is a high-frequency service from Clapham Junction along the Brighton Main Line. Most of these services terminate at Victoria. 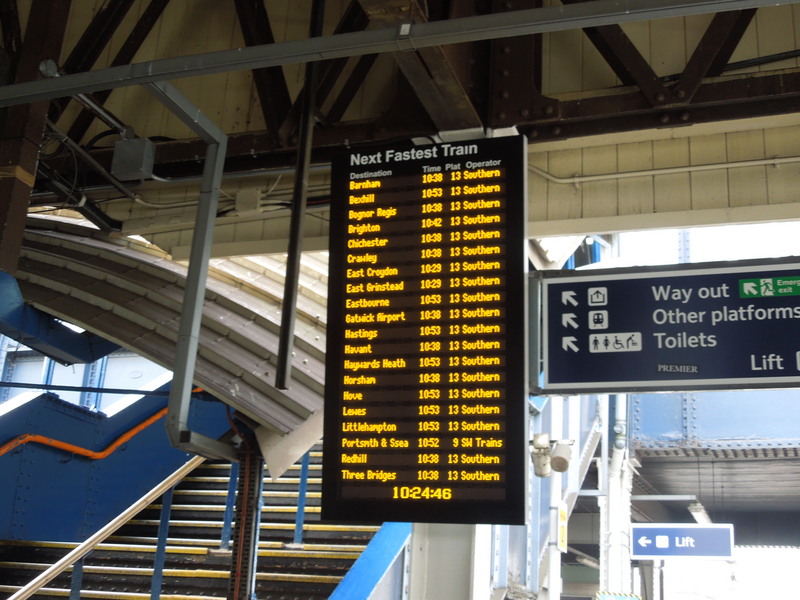 The named stations, except for Hastings and Eastbourne, will also be served by Thameslink. From the passenger point of view, those going to and from London from the Brighton Main Line and South Coast stations, have a choice of London terminus. Thameslink – London Bridge, Blackfriars, City Thameslink, Farringdon, St. Pancras and Thameslink’s Northern stations. Southern – Clapham Junction and ictoria. The two separate routes have Central London fully covered. Suppose you want to travel from the extremities of Crossrail and Thameslink to say somewhere like Basingstoke, Bournemouth, Exeter, Portsmouth or Southampton, that is served by Waterloo and Clapham Junction in Central London. From Brighton and other stations on the South of Thameslink, there is a high-frequency Southern service. From Luton and other stations on the North of Thameslink, you will probably use the Jubilee Line between London Bridge and Waterloo. From Shenfield and other stations on the East of Crossrail, you will probably use the Jubilee Line between Bond Street and Waterloo. From Heathrow, Reading and other stations on the West of Crossrail, you will probably use the Bakerloo Line between Paddington and Waterloo. All the Underground interchanges will be fully step-free with lifts and lots of escalators, but the connections could be simpler. The building of the new mega-hub station at Old Oak Common will tie together the following lines. There is also the possibility of the West London Orbital Railway linking Old Oak Common to Hendon and West Hampstead Thameslink. Old Oak Common and Clapham Junction stations will be two mega-hub stations, that for obvious reasons will need a high-frequency connection service. Currently, that is planned to be the following services. 6 tph – London Overground from Stratford to Clapham Junction. 1 tph – Southern from Milton Keynes to East Croydon. It is not enough, especially, if either connection at Old Oak Common and Clapham Junction is a long walk. But there are easy ways to increase the numbers of connections. In his report, Chris Gibb recommended that this Milton Keynes to East Croydon route be transferred to the London Overground. I wrote about this in Gibb Report – East Croydon – Milton Keynes Route Should Be Transferred To London Overground. In my view Chris Gibb is right for the following reasons. All passenger services on the West London Line would then be run by London Overground. London Overground have a reputation for running a good train service. The Milton Keynes to East Croydon service could be integrated with the Watford DC Line, the North London Line and a possible West London Orbital Railway to produce an integrated frequent local service in an area of West London, that needs a greatly improved train service. Frequency between Old Oak Common and Clapham Junction could be raised to as high as ten or twelve tph. It would improve connections between Watford and the expanding Wembley Stadium complex with South London. I doubt it would be an expensive and difficult project to move this service between operators. The track is all in place and with a new bay platform at Hounslow, trains running on batteries could work Phase 1 with ease. The batteries would be charged South of Acton Central station. Because of the importance of Clapham Junction as an interchange,, would it be a sensible idea to extend Phase 2 from Kew Bridge to Clapham Junction, by way of Chiswick, Barnes Bridge, Barnes, Putney and Wandsworth Town stations? This may not be possible, as the route may not be able to accept four extra trains. This map from carto.metro.free.fr shows the track layout around the two Overground platforms at Clapham Junction. I also took these pictures of Platform 2. I suspect that a bay platform could be added, opposite to Platform 2. There would appear to be plenty of space. The platform would share the lift, facilities and staff with Platforms 1 and 2. It would make a good interchange, with simple connections to Platforms 1 and 2. There could even be the possibility of making Platform 2 bi-directional so that a loop service from Hendon to Dalston Junction could be created, if that was considered the best solution. One advantage of extending the Phase 2 Kew Bridge route, would be that it would give more electrified running to charge a battery train. If this route from Hendon to Clapham Junction via Old Oak Common and Kew Bridge can be successfully created, it establishes the important link between the Luton/Bedford branch of Thameslink and Clapham Junction. There is no direct route, but probably the fastest is to dive into the Victoria Line at Finsbury Park and go to Vauxhall, from where it’s a single stop to Clapham Junction. Just avoid changing to the Victoria Line at St. Pancras, unless you like long walks. Three factors will determine how good using a double change at Old Oak Common and Clapham Junction to get between Crossrail and Clapham Junction will be. The frequency of trains between Old Oak Common and Clapham Junction. The quality of the interchange at Old Oak Common. As it will also involve HS2, I suspect it should be good. The quality of the interchange at Clapham Junction. It probably needs improvement, but it’s not bad for something designed by the Victorians. It could be a very good link. Could Thameslink Serve Clapham Junction Directly? From the Brighton Main Line, there is a frequent service, but going North to Thameslink is not easy. It could be possible to use the West London Orbital Railway to get to and from Hendon, but whether anything other than a local route is needed is open to doubt. Could Crossrail Serve Clapham Junction Directly? This Google Map shows the Old Oak Common area. The railway running across the map to the North is the West Coast Main Line, whilst the Great Western Main Line goes across the bottom. Looking at the map in detail, it might be possible to thread flyovers or dive-unders into the area to allow Crossrail trains to take the West London Line to the North or South from the East or West. There are certainly some large industrial sites that could be cleared. There are a couple of cemetries too. There are Central, Chiltern, Crossrail, Great Western Main Line, HS2, North London Line, West Coast Main Lines to connect together. A Heathrow to Gatwick Link could be threaded through. It all depends on how much can be spent! And Then There’s The Heathrow Southern Railway! This is a bit different, as it’s a privately-funded railway that aims to sneak into Heathrow by following and hiding by the M25 and the use of the odd tunnel. 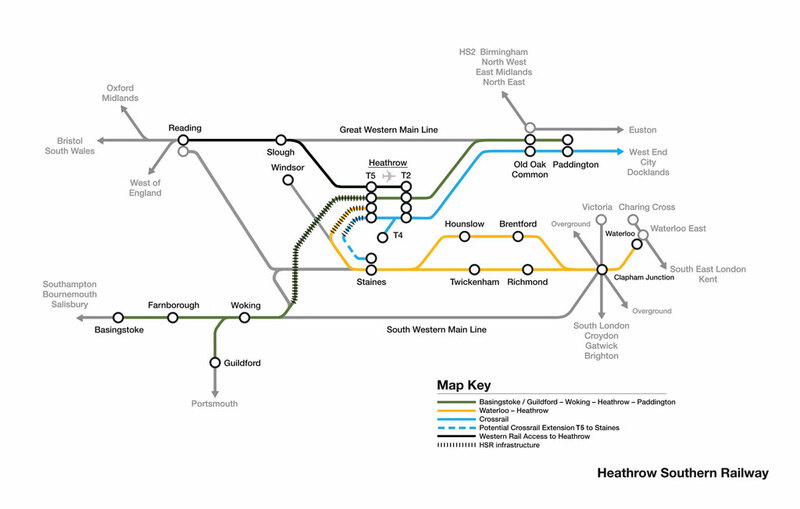 This map is a schematic of the proposed railway, which is caused the Heathrow Southern Railway. The blue line is Crossrail. The yellow line is a direct link from Waterloo to Heathrow. The station in a six pointed star is Clapham Junction. On the Heathrow Southern Railway web site there is a section called Service Opportunities. New track will run along the M25. Trains will be fully-integrated with South Western Railway. Four tph should be possible with planned capacity improvements. A bay platform will be added at Staines, within the current railway. Xrossrail could be extended from Terminal 5 to Staines. Heathrow Southern Railway envisage that a lot of passengers from Staines will use Crossrail for London. The web site says this about the route. An exciting additional benefit of Heathrow Southern Railway is the scope to introduce half-hourly services from Basingstoke and Guildford to Heathrow and Paddington. These trains would provide a 15-minute frequency from Woking, with stops at Farnborough Main (Basingstoke services), Woking, Terminal 5, Terminal 2 and 3 and Old Oak Common. I like the ideas and the tone of the project. With all the ideas in the West of London, I think that some very good things will happen to the railways in the area, whether Heathrow Airport builds another runway or not. Clapham Junction will have some rivals for ‘busiest station’ soon. The station as a whole has 144tph total through it between 0800 and 0900 on a weekday. Farringdon, when Crossrail is complete, should boast around 150tph (2x24tph Crossrail, 2x24tph Thameslink, 2x28tph SSL, going up to 32tph when the resignalling is complete). Moorgate, again when Crossrail is complete, should manage around 160tph (2x24tph Crossrail, 12tph Northern City, 2x28tph SSL, 2x24tph Northern Line). London Bridge may be the winner though. Including tube services, it could see over 250tph during the peaks (2x16tph Thameslink, 28tph+20tph Charing Cross, 22tph + 16tph Cannon Street, 20tph Southern, 2x32tph Jubilee, 2x28tph Northern Line). There’s also Berlin Hbf, but then the Germans don’t work their infrastructure so hard. The Waterloo expansion will increase traffic through Clapham Junction. Still Clapham Junction doesn’t do bad for a Victorian station!